...and a dab of threadlock. If you have no access after build, glued in captive nuts, if paranoid, with sone wood glued over them. They won't move. If you have access after build, please yourself. Tee nuts for me as well. Just make sure that the firewall wood is plenty strong and won't crush when you wind in the fixings fully. I use a suitable cap head bolt with a large steel washer under its head. Never had one come loose. Beware hi-strength loctite on the threads, might give problems if you have to get the mount off. I've known screws to shear with HS stuff if you're unaware it's been used or you've forgotten about it and don't get the threads hot to soften it. Medium strength is fine. If you do, a tap will clear the thread. A bit of Vaeseline on the thread is a good idea to stop epoxy sticking. I always drill the holes and fit the T nuts before fitting the firewall to the fuselage. I usually use spike nuts (tee nuts?) as shown in the photos above. Apart from making it simple to attach the mount when access behind the firewall is tricky, they spread the load wider than the washer that would normally be used on a bolt of the same size. The only disadvantage I've found is that you then have to get the correct length bolts to attach your mount, so that they don't protrude so far through the firewall that they can damage the fuel tank or battery behind it. I've gone over to using threaded inserts available from Modelfixings starting from 4mm thread size. I like them, too but it's a shame 4mm is the smallest size. I asked Ian at Modelfixings some time ago if he could get 3mm ones but he tried and failed. 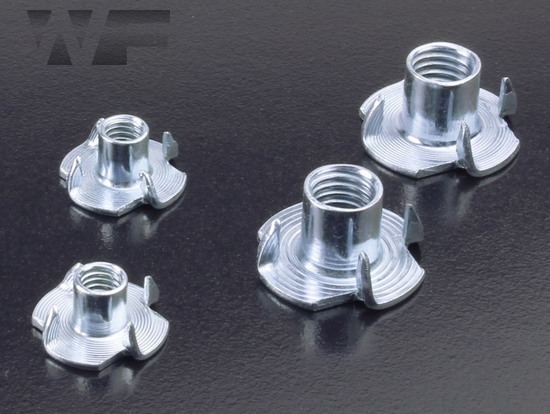 They'd be useful for things like cowl fixings. A piece of PCB with nuts soldered on the copper side then gf side cyanoed to the firewall. Spreads the load & no danger of damaging the ply edges. I do cut to length, using my Dremel with a cutting disc. Should have mentioned that. I'm also a fan of Modelfixings. 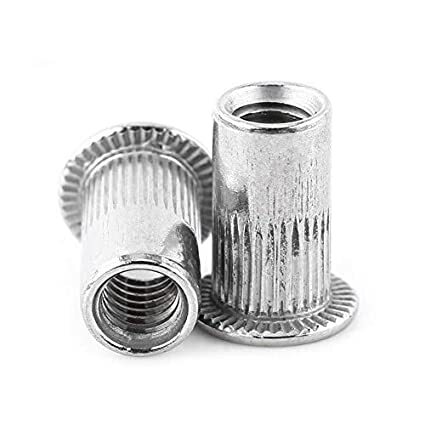 Those are rivnuts and work the same way as rivets but provide a threaded fixing. I don’t think they would be suitable for ‘front fixing’ the same way that the threaded inserts do as there is nothing to prevent them pulling out (epoxy maybe but would you risk it?). Of course youn could rivet them to an alloy plate then screw that to a bulkhead.